Want to know where the best dog-friendly breakfast, lunch and dinner spots are? 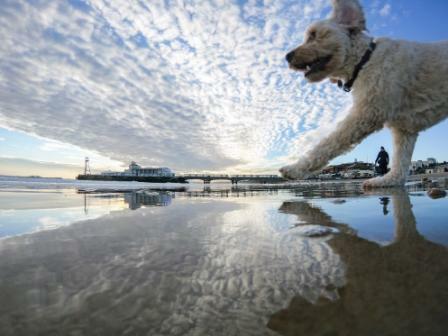 Bournemouth’s coast has a wide range of eateries where you can take your canine along with you. Have a look at our recommendations, relax, sit back, and plan your next foodie adventure with your pooch. Start off your day at Cafe Boscanova with pancakes and a coffee or go for a Surf’s Up English breakfast at Urban Reef. For a quick bite at lunch, we highly recommend a visit to Little Pickle Deli Café for a scrumptious sandwich or panini. However, if you’ve got more time to spend lunching, ‘have a flavour fling’ at The Neptune and try out their fish, chicken or vegetarian goodies. For dinner, pop by Chaplins Cellar Bar to enjoy their locally sourced, home-cooked specialities. On the quest for a healthy veggie dinner? The Urban Beach Hotel’s Bistro has a diverse vegetarian & vegan menu, comprised of fresh and delicious dishes. There’s nothing like a quintessentially English afternoon tea, so visit Hotel Miramar with your family and your pup to indulge in a Dorset cream tea, dainty savouries, pastries and scones. Up for a classic grill? Or a heart-warming pasta? Hallmark Hotel Carlton is the place to go to. However, if you want a hearty lunch…with a twist, check out Sun Cliff Hotel’s Overcliff Pub and build your own burger! Grab a quick bite at The Bell! It’s a lovely traditional community pub, and very close to the train station. Therefore, the perfect place to plan your next adventure! There are endless breakfast possibilities here, however, one that you and your pooch may particularly love is Cafe Riva. It’s got delicious eggs, porridge and bacon sandwiches. If you need a bit of an energy boost before lunch, brunch at Ludo Lounge is the answer for you. Indecisive with your meals? The Commodore offers steak, ribs, sea bass and prawns… all on one plate. If you love craft beer,Brewhouse & Kitchen have an ingenious menu which matches all varieties of beer with a delectable selection of dishes, so make sure to stop by and find out what the recommended brew for your favourite dish is! Grab a coffee and a snack at the Offshore Café while gazing at the scenery with your four-legged friend. At lunchtime, pop into Key West for some grilled gourmet or West Beach, if you want to treat yourself to a luxurious seafood dish. Otherwise, grab a classic fish & chips from Harry Ramsden and enjoy it by the beach with your family, friends and your pup. Hallmark Hotel West Cliff has a great meat platter, that no meat lover should miss. We also recommend Hotel Collingwood’s famous Sunday lunches. Go spice up your life with Camden’s Thai flavours or opt for a traditional British dish at Circo Lounge. If you’re a big pub food lover, The Westbourne and The Porterhouse are worth a visit. You can never go wrong with a pizza; especially one from The Libertine cooked to perfection in their wood-fired ovens. The whole family will love it! If you want to really treat yourself, check out Riviera Hotel’s Cunarder Restaurant’s ‘Ultimate Tea’. It’s a luxury combination of Bucks Fizz, macarons, mini cakes, finger sandwiches and scones. Make sure you take your pup out for a meal in one of these excellent dog-friendly foodie spots. Celebrating the Chinese New Year and Year of the Dog, remember to download the free Go Bournemouth Coast app and join in on the hunt for Lucky the Dog, which runs until 10th March. Visit the participating retailers, take photos with Lucky the Dog and upload them on social media using #GoBoCoast to win amazing prizes, including a Fujifilm Instax Mini 8 Camera.